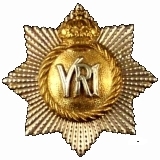 The following Officers, Warrant Officers, non-commissioned officers and soldiers of The Royal Canadian Regiment were casualties of the First World War. This list is an update from the one published in the first volume of the regimental history (Fetherstonhaugh, 1936). As part of project to review the Roll of Honour while holding the position of Regimental Adjutant, I was able to identify a number of soldiers who had gone unrecorded by the Regiment as casualties. For the most part, these included soldiers who had been released and repatriated as medically unfit who later died of their wounds. 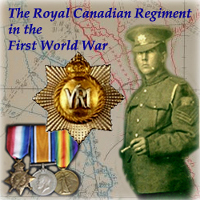 Athough they were officially recorded by Canada as soldiers of The RCR, no part of the administrative process that recorded their deaths at the time ensured that the Regiment was also informed. 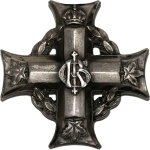 As this sometimes happened years after the soldiers left regimental service, it is only through the recent availability of online databases and related sources that has allowed them to be identified. It should be kept in mind, however, that this list does not include soldiers of the Regiment who may have transferred to other units, and whose deaths were recorded as soldiers of those units. The "CVWM" links in the table lead to the applicable page at the The Canadian Virtual War Memorial, for some soldiers the link is to theCommonwealth War Graves Commission (CWGC) database. A full list of the CWGC cemeteries holding Great War casualties of The RCR can be found here. This list is linked to individual pages for each cemetery including directions, a list of RCR graves and a Google Maps link. 565 2381580 Pte John J. OMAND 4 Aug 1920 Hamilton Cemetery, Ontario, Canada - To be added to Book of Remembrance, confirmed May 2010.